There are many types of oral surgery that you may need, and when choosing your oral surgeon, it is imperative that you choose someone you trust. At Printers Row Dental Studio, Dr. Ema is highly-trained and experienced as an oral surgeon and is committed to providing unparalleled patient care. There are a number of reasons that you may need oral surgery. If you’re looking for a trusted Chicago oral surgeon, you’ve come to the right place. Dr. Ema understands that oral surgery can be a great source of anxiety for many people, and she is proud to offer in-office amenities and sedation to make your experience as comfortable and painless as possible. Root canals are an important procedure that are intended to save your natural tooth. If the pulp of your tooth is infected, Dr. Ema will actually go into your tooth and clean out the infected tissue in your root canal. By doing this, she is able to stop the infection, saving your tooth and the surrounding tissues. If Dr. Ema tells you that you need a root canal, don’t worry. Root canals are safe, and Dr. Ema is highly experienced in performing the procedure. Whether you’re experiencing a broken tooth, a decayed tooth, or wisdom tooth pain, tooth extractions are very important dental procedures. Tooth extractions can be daunting, but at Printers Row Dental Studio, you can be confident you’re in good hands. If you need a tooth extraction, call Chicago’s leading oral surgeon, Dr. Ema, at Printers Row Dental Studio today! When you’re missing a tooth, replacing that tooth is not only an important aesthetic choice, but it is also important for your overall oral health. By replacing a missing tooth with a dental implant, Dr. Ema will surgically implant the post into your jaw. This actually helps preserve your jawbone and, in turn, the overall structure of your face. In most cases, Dr. Ema will use an intravenous (IV) anesthetic, but nitrous oxide (laughing gas) or a local anesthetic may also be used. Dr. Ema will discuss your options with you and guide you in choosing the best anesthetic option for you. After your surgery, someone will need to drive you home, as you will not be able to do this by yourself. You will most likely experience pain at the extraction site, and some patients experience blood at the site. Following oral surgery, depending on the type of surgery, you will likely be able to resume normal activity after the first day. However, we do recommend that you take it easy for a few days after the surgery and give yourself ample time to heal. Dr. Ema is devoted to ensuring both your safety and your comfort before, during, and after your surgery. 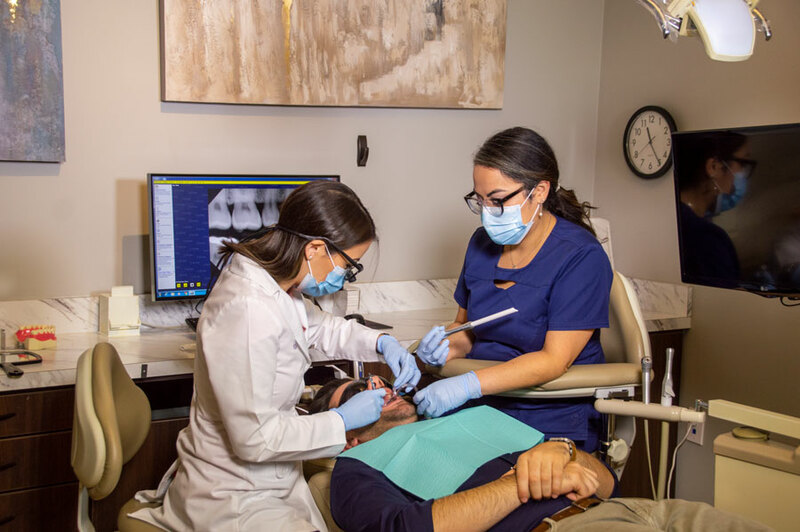 We understand that surgery can be a frightening prospect for some, and at Printers Row Dental Studio, it is our goal to make your experience as stress-free as possible by providing you with our best care. We are here for anything you may need before, during, and after your surgery. Dr. Ema is specially trained to give you the highest quality of care and comfort. If you need to have oral surgery, don’t wait any longer. Call our office today at (312) 435-0411 to schedule your appointment or request one online.